At Leks Law, we know you have endless choices when it comes to choosing legal representation. We pride ourselves on not only providing superior work product but also on building long lasting relationships, having clear communication channels and maintaining transparent billing practices with our clients. Our services focus on assisting companies with venture financing deals, complex sales transactions and reorganizations, and joint venture arrangements. Whether a company is just starting off or is well established, we can assist with a variety of business matters including formation of their company, employment matters, intellectual property matters, and dissolutions and winding up of company affairs. Our top priority is ensuring that our clients feel not only satisfied but are truly happy with the services we provide. Leks Law counsels its clients throughout the life cycle of their investment activities, from the seed financing stage through to various rounds of venture capital investments, with an eye towards an ultimate exit strategy to bring profitability both for the company and its investors. Our goal is to guide our clients on their growth path and to assist them in the timely and comprehensive execution of all financing documentation. Leks Law has experience representing both buyers and sellers, whether companies or individuals, entering into relatively small and simple stock or asset purchase deals to complex cross-border reverse mergers. In conjunction with such transactions, we bring to the table multi-faceted experience in the mergers and acquisition field. Not only do we handle the core aspects of the merger or acquisition beginning with the letter of intent through post-close matters, but we also ensure that any and all tax, financial, employment and intellectual property issues that may accompany the transaction are concurrently addressed and properly made an integral part of the corporate deal at hand. Leks Law advises companies on all elements of internal corporate law, including board of director and shareholder meeting procedure, director and officer responsibilities and shareholder rights, corporate policies, and rules of conduct. We are available for the occasional question or can be there every step of the way to provide ongoing support and guidance. Leks Law ensures timely filings of all federal, state and local reporting requirements and can ensure that all corporate formalities are complied with and kept up to date and in an organized fashion. Leks Law represents companies, employees, independent contractors and individual officers when negotiating and drafting various employment agreements, along with executive compensation considerations. All accompanying documents such as non-disclosure agreements, proprietary information and invention assignment agreements, stock option plans, and restricted stock purchase agreements are provided by our firm. During the employment relationship, we advise the company or employee on federal and state workplace laws and, if needed, assist with the communication of those laws in an Employee Handbook. We assist both companies and employees when the employment relationship comes to an end and guidance is needed for a smooth and efficient exit. Almost every business transaction includes intellectual property considerations and Leks Law can assist the client in protecting the ownership of that intellectual property, drafting comprehensive collaboration paperwork for strategic alliances, or documenting the transfer of that intellectual property through licensing and transfer agreements. We also assist our clients with registering trademarks in the U.S. and ensuring that any trademarks that are filed abroad are also properly registered in the U.S. We have extensive experience with drafting website privacy policies and ensuring that companies abide by data privacy laws. Leks Law counsels landlords, tenants, developers, and lenders on leasing issues in both residential and commercial lease agreements. Real estate projects can include, among others, retail and shopping centers, mixed-use properties, office space, condominium complexes, restaurants, bars and entertainment venues, and warehouses. Ms. Mezek is the founder and owner of Leks Law and assists businesses with the initial formation phase, financing needs, various capital raise rounds, and ultimately with any mergers, acquisitions and other business reorganizations. Ms. Mezek also works with foreign companies that are looking to expand their operations to the U.S. Utilizing a broad network of professionals in the accounting, banking and immigration fields, she can help ensure a smooth transition to an otherwise potentially daunting market. Ms. Mezek has worked with companies ranging from startups to multi-million dollar revenue companies in various industries including industrial product manufacturers (e.g. gasket sheets and LED light bulbs), software companies, consumer goods manufacturers (e.g. hands-free dog leashes and organic feminine hygiene products), as well as companies in the service industry (e.g. restaurants, yoga studios, and insurance providers). In addition to being an attorney, Ms. Mezek also holds a degree in Finance and is thus able to understand and appreciate the financial and business nuances of any transaction and ensures that these concerns are successfully intertwined with the legal documentation. 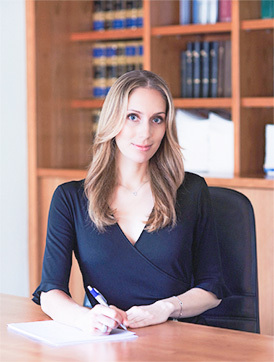 Prior to starting her own firm, Ms. Mezek worked as in-house counsel for Goodyear Tire Company in Slovenia where her legal team was responsible for the corporate needs of 15 Central and South Eastern European countries. In addition, she has worked for law firms in Los Angeles and San Francisco Bay Area. With this broad range of experience, Ms. Mezek understands what her clients’ needs are and prides herself on ensuring that they receive the support and results that they expect. You are invited to write a message in the space provided or please call Leks Law at the phone number below. I look forward to connecting with you.